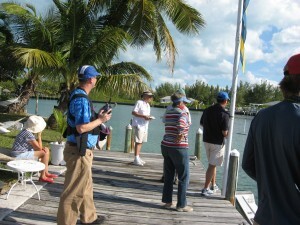 Round 3 of the RC Laser Tour of Abaco took us to Treasure Cay for a beautiful, sunny, and warm day of RC sailing. Light winds were the forecast and out of the northeast. 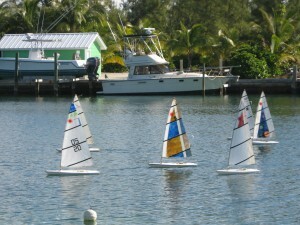 We got in 7 races, with a dying wind and an outgoing tide. Dwayne Wallas won race #1, but Jim Kaighn took over winning the next 6 in a row. David Mulock showed moments of brilliance, with a 2nd in race 2 which broke the tie for 3rd over Anders Ljungholm. Thanks to the Ljungholms for hosting us and providing the Swedish desserts. Photos by Ylva Ljungholm. And thanks to Lenore Mulock who is back on the job. We are heading to Little Harbour February 8. Come join us for lunch at Pete’s Pub and a 2:00 start.